In BÖRSE, we offer our customers custom printed paper bags with applied UV varnish (Ultra Violet) to create an eye-catching contrast; the varnish we use is water-based, we are able to perform full varnishing or Spot UV varnishing process only on to certain areas of your bags, this process is knows as SPOT UV varnishing, it is necessary to have the desired bag areas printed and isolated over a positive template; this template serves as a guide that indicate the areas of the bag where the varnish should be applied. The UV varnish can have a matte or glossy appearance, when applied only on to certain areas of your shopping bags, we can obtain a watermark or polished effect, for better results, we recommend it applied only on your logo, on a pattern or over certain elements of your bags design. We recommend that you quote your UV Varnished paper bags especially when the printed design makes use of dark background colors and/or intense solid colors, such as black, brown or dark red. 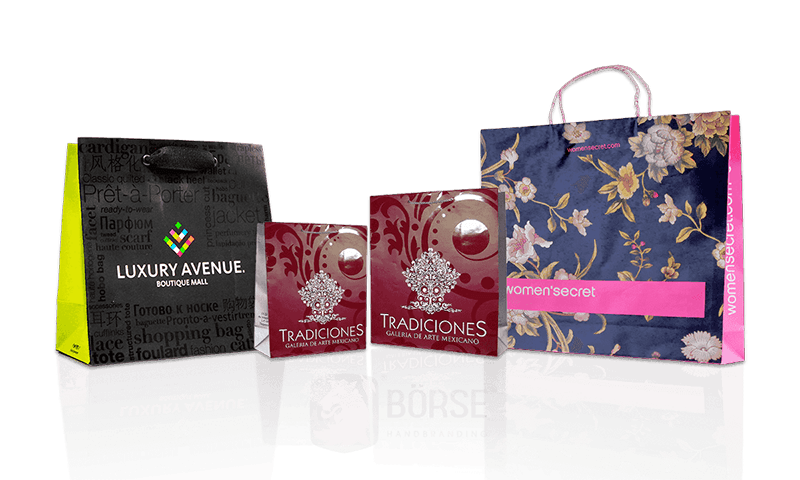 To achieve the best results, we recommend you to contact our shopping bags design department where our specialists will guide you in the design process to make your bags suitable for Spot UV varnishing. At BÖRSE, we offer paper bags with SPOT UV varnish or fully varnished and printed in various sizes. The following table shows the sizes that most of our clients request. 4¼ IN. 2¾ IN. 8½ IN. 5½ IN. 2¾ IN. 8½ IN. 7 IN. 4 IN. 9 IN. 7½ IN. 4¾ IN. 11½ IN. 9 IN. 4¼ IN. 13 IN. 9½ IN. 4 IN. 9 IN. 9¾ IN. 2½ IN. 12½ IN. 12 IN. 4¼ IN. 15 IN. 13 IN. 6 IN. 16 IN. 16 IN. 6 IN. 19¾ IN.